www.monwoodphotography.com MonWood Photography is a collaboration of works by Sara Monnett and Toby Blackwood, husband and wife. Based out of Nashville, Indiana, they provide all southern Indiana and surrounding areas with custom wedding photography packages. Toby has over ten years of experience in photography with a wide range of formats and subject matter. In 2005, he graduated from the Herron School of Art and Design with a Degree in Fine Arts, majoring in Photography. When he is shooting, he looks for the relationship between the subject and its environment. Sara picked up the camera five years ago and she haven't set it down much since. she loves photographing weddings, couples, mothers to be, and the little ones. Prior to being a full time mama and part time photographer, she worked as a Pastry Chef, Event Planner, and Catering Coordinator. 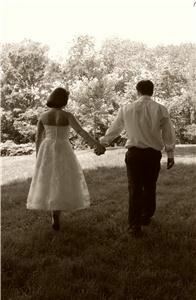 Together they have 15 years of experience in the wedding and photography business. They are always ready for the unexpected moment and they are there to capture it! Toby and Sarah did a exceptional job at my son's wedding. They took many, many pictures without posing every shot. I highly recomend them. As a Photography Buyer I can tell you that the Quality is eceptional.